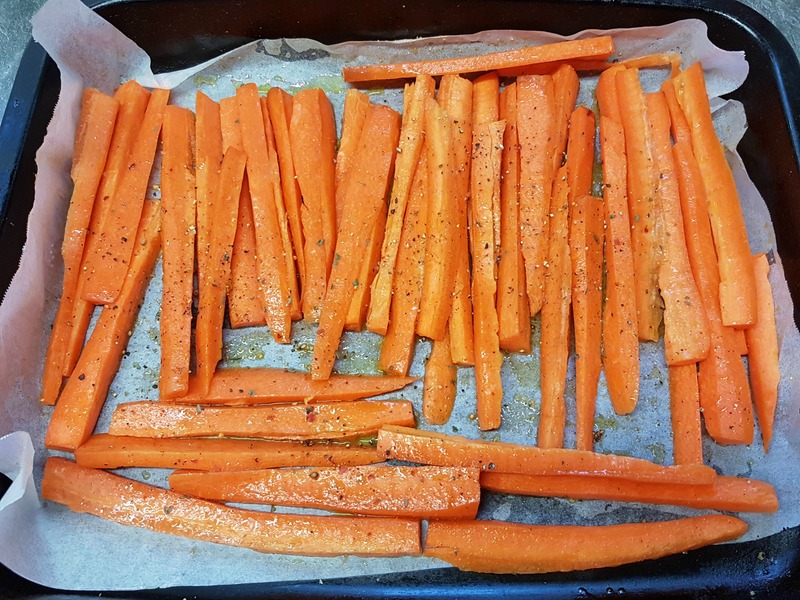 Since a mate dropped off a whole heap of carrots, and I mean a whole heap (we took half to the neighbours) we’ve been going crazy on carrot related dishes. 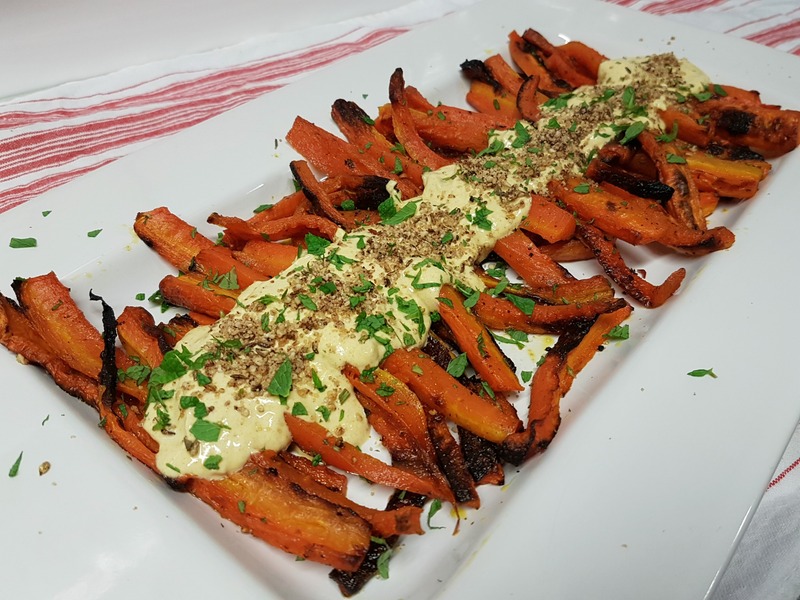 So far, apart from my tried and tested cafe-style carrot cake, this Roast Carrot Salad with Spiced Yoghurt Dip and Dukkah, is in firmly our No1 Best Dish. My fussy monkey of a son would debate that… He’s a fan of the humble carrot stick. This is, more often than I care to admit, constitutes the vegetable component on his plate. Oh, sometimes we give him a chopped up apple (he doesn’t eat fruit…). We’ve been making a little progress though: Recently he’s progressed to eating broccoli. Stop the bus. Carrots, I’ve decided are such an underrated vegetable. Why? Well, you can eat them any which way. Eat them raw. Devour them with dip. Grate the buggers and whip up this crowd pleasing salad. Or why not roast them for Sunday dinner, or have them as part of this scrummy roast vegetable salad? Turn ’em into soup (carrot and coriander is a firm favourite in my book, I should blog that one next!). Oh – Then there’s my Cafe-Style Carrot Cake and my Carrot Date and Nutty Muffins (refined sugar free)… The options are, seemingly endless! 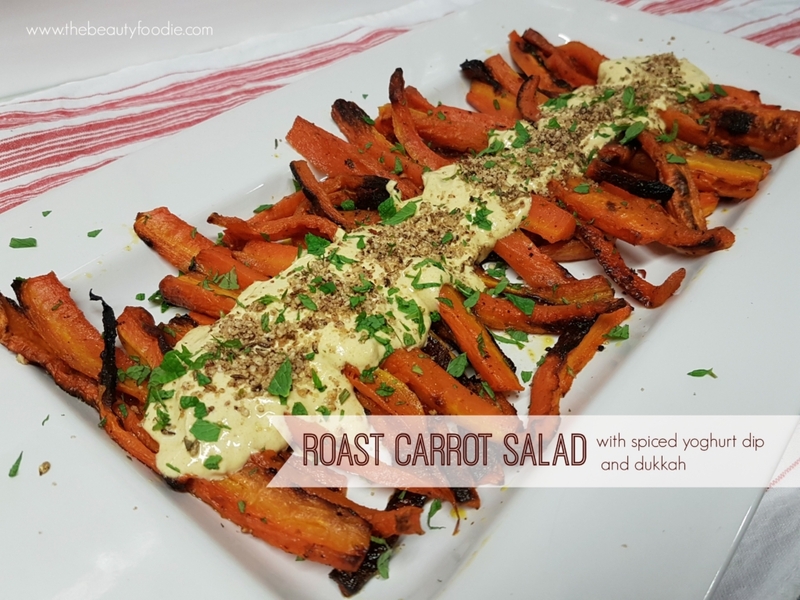 As for this roast carrot salad with spiced yoghurt dip and dukkah, I love the sweetness and crunch of the carrots which contrasts with the smooth creaminess of the yogurt dip. The addition of dukkah takes the salad to the whole next level. Do I need to do a plug here for my dukkah recipe? Well OK. Here you go. Click here! (shocking dukkah photo… Must redo that… At least I’ve upped my photography game). PS What’s your favourite carrot-based dish? Preheat oven to 220 degrees (normal) fan bake. Line a roasting dish with baking paper. Peel the carrots. 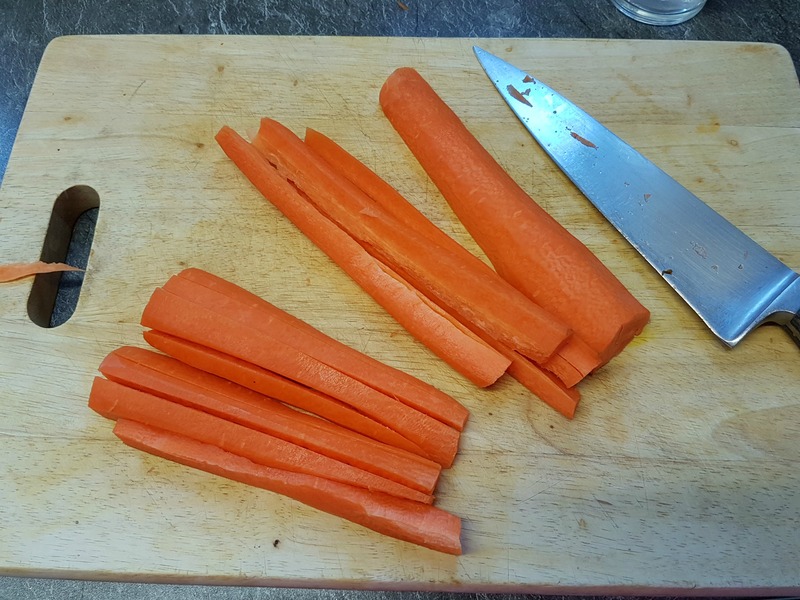 Cut each carrot in half lengthways, then cut into quarters (check out the picture) and then place in the roasting dish. Mix together the oil, honey, cumin and coriander. Drizzle over the carrots and toss to combine. Season well with salt and pepper. Roast for 35-40 minutes until very golden, turning over half way through the cooking time. While the carrots are cooking, combine all yoghurt ingredients in a medium sized bowl and season to taste. When carrots have finished cooking, place them on a large serving dish. When cooled, drizzle with the yoghurt dressing then sprinkle with dukkah and mint. Tahini (sesame seed paste) can be bought at most supermarkets, or at health food shops. If you don't have dukkah and can't be bothered making it, chop up some nuts (almonds/cashews) and sprinkle with toasted sesame seeds. Easy!